I knew my current theme was not mobile friendly, so I installed WPTouch, which is a free plugin. 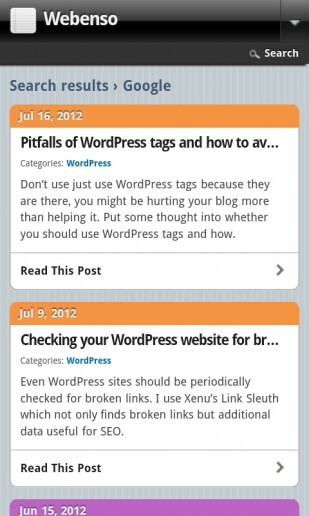 Great for a blog, WPTouch will show a list of your posts in a mobile friendly way. The free version of WPTouch does not support the iPad and does not give the ability to “brand”. With the free version, your site on a smartphone will look pretty similar to the other sites that have the plugin (so at least tweak the post listing options!). If you are worried about the fact that you lose your logo and “look” when your site is viewed on a smartphone – then you should consider the WPTouch Pro version. You sound like me. I was a little late to the mobile party because when I was not looking at my computer the last thing I wanted to do was look at the internet on my phone. But it’s great when you are traveling and remember – that many people are using mobile more and more and not looking at their computer that much. Just look around when you are waiting for a movie or concert to begin.